I'm not even going to deny it- having a grill, let alone a backyard, in New York City is kind of amazing. But it's also very rare. Before we moved into our current apartment, I often lamented for the 'burbs and their spacious yards complete with grills. Memorial Day would roll around and with it would come my summer BBQ dreams, dreams that were so intense it was as if I could smell the meat sizzling right on the grill. All of my dreaming led us to figure out ways that we could bring the "grilling" inside, recreating summertime favorites with things like our beloved grill pan. Now, thanks to our backyard, our grilling has moved outside to its rightful home, the grill, but I still love making some of my summer-appropriate, pre-grill-days favorites. One such favorite is lettuce wraps, or, in this case, cabbage wraps. These Polynesian ones have a fun tropical twist and lots of bright colors, both things that are almost too perfect for summertime. 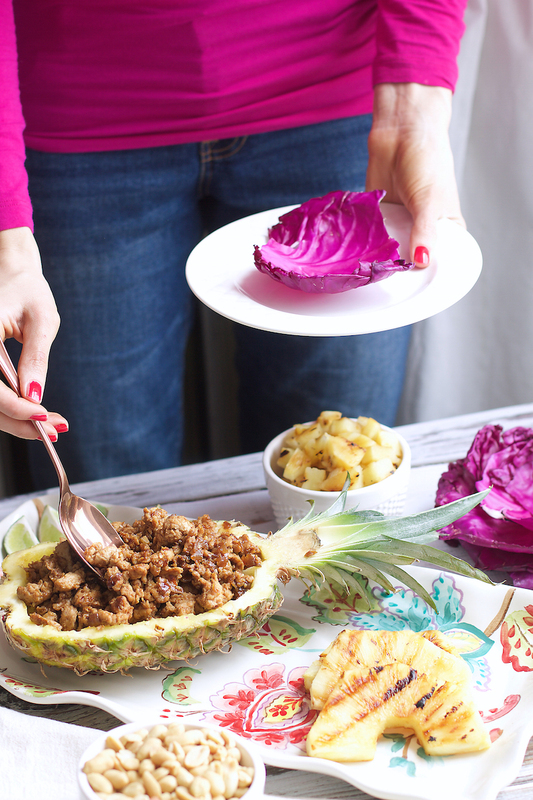 I used Shady Brook Farms ground turkey meat, a favorite go-to lean meat that we have been using for years, to make a flavorful, spicy filling that has hints of Asian cuisine. Shady Brook Farms turkey is produced without growth-promoting hormones, yet their wholesome products, thankfully, don't come with a premium price tag, allowing the Mr. and I to grill up lean meat (as opposed to heavy burgers and sausages) all summer long. So once your tasty filling is ready, it is then placed inside a colorful piece of cabbage after which it is topped with pineapple (grilling it is optional), crunchy peanuts, a squeeze of fresh lime juice and my favorite chimichurri sauce. Besides the incredible flavor that these wraps have, I also love that they are light and healthy and gluten-free. With so many food allergies in this day and age, it’s nice to be able to offer friends and family tasty options (besides just a bunless hot dog, because how sad does that sound?!) at summer get-togethers. Whether you're like most New Yorkers and don't have a grill, or you're lucky enough to own one, no grill is necessary to enjoy these fresh and tasty bites from Memorial day straight on through all summer long. In a large skillet, set over medium heat, add the sesame oil and heat for 2-3 minutes. Add in the ground turkey and sauté until browned and cooked through, about 10 minutes. Stir in the vinegar, soy sauce, spices, ginger, garlic, sugar and sesame seeds. Continue cooking and stirring for about 5 more minutes. You can either use the meat immediately or store it in an airtight container in the fridge for up to 24 hours in advance. To assemble the wraps, place a couple of tablespoons of meat in the center of a piece of cabbage. Top with some pineapple and peanuts, a squeeze of lime juice and chimichurri sauce (not necessary, but it does taste good). Store any leftovers in separate containers to avoid the peanuts or cabbage from becoming soggy. Meat will keep in the fridge for 3-4 days and can then be reheated before serving or used cold.